For me, Autumn conjures up images of bright skies and crisp mornings, dew decorating the cobwebs, beautiful harvest festival displays, kicking leaves in the woods, bonfires with exhilarating displays of fireworks and, of course, I couldn’t ignore Halloween – what to carve on this year’s pumpkins, dressing up the children and their excitement at trick or treating. 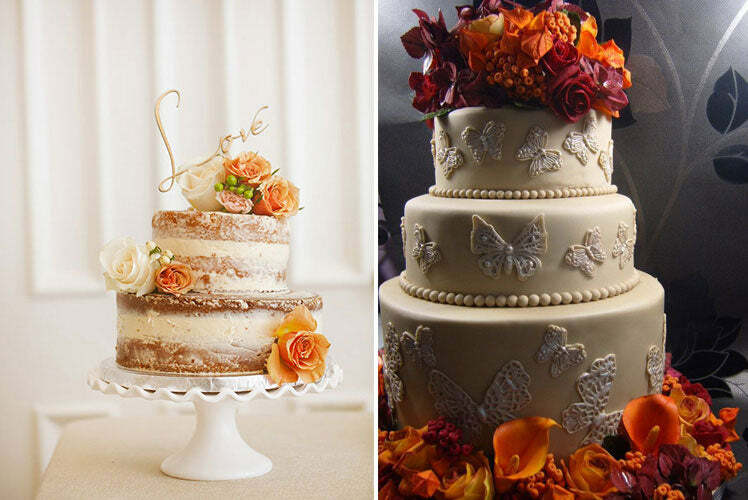 With a palette of warm tones, Autumn is the perfect season for creating an inviting wedding theme. The leaves alone give you an array of shades as they alter from deep green through to rustic red, golden yellow and vivid orange. From vibrant to muted combinations, you’ll be spoilt for choice with the hues that symbolise this fabulous ever changing season. 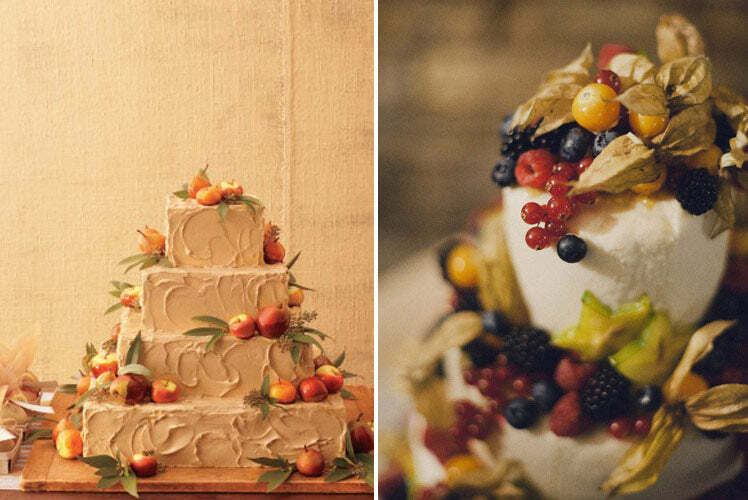 And what better way to enhance your Autumnal theme and its beautiful colour palettes than with your wedding cake? Naked cakes have become a favourite with brides over the last two years and many will prove to be the inspiration for a wedding theme. As the sponge and fruit will need to be fresh, for the best results you will need the cake to be prepared either on the day or the day before the wedding. A perfect choice for an Autumn ceremony as seasonal fruits such as blackberries, figs, plums and apples are rich in colour, full of flavour and have a wonderful harvest festival feel. Enhance a fruit theme and flavour the sponge or buttercream (I particularly liked Martha Stewart’s suggestion of apple cake with caramel-apple buttercream!) and your cake will be truly scrumptious. With the harvest festival feel of Autumn, a rustic theme can easily be achieved. 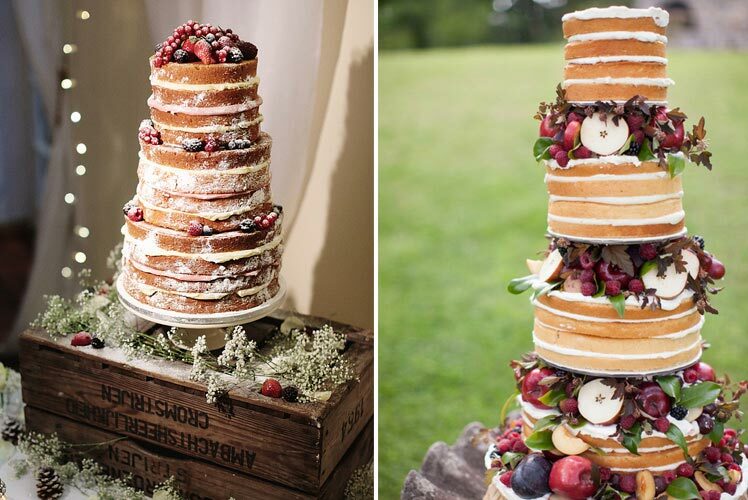 Stand a naked cake on a wooden platform or scatter fruit on the table to accentuate a fruit topped design. 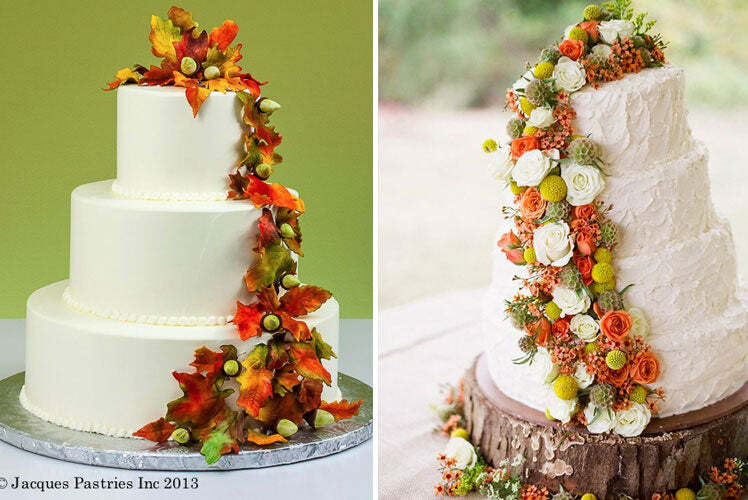 Acorns, twigs and leaves also make ideal embellishments for your seasonal cake. Jacques Pastries created a stunning example of how beautiful these finishing touches can look (below). For budget friendly decoration take a walk through the woods and collect pieces of nature for your table decoration which will coordinate with a stunning au naturel cake. For a more traditional cake, why not opt for flowers in Autumnal shades. Autumn is represented by a kaleidoscope of awe inspiring colours. Choose blooms such as Chrysanthemums, Santini, Calla Lillies and, of course, Roses which range from the deepest red to the most delicate creams, and scatter them around your cake or add a floral cake topper for statement style (as seen in Elizabeth’s Cake Emporium design below). For a coordinated theme choose the same blooms for your bouquet or your bridal party. If I am looking at the inspiration that the wonderful season of Autumn can provide I can’t ignore Halloween. 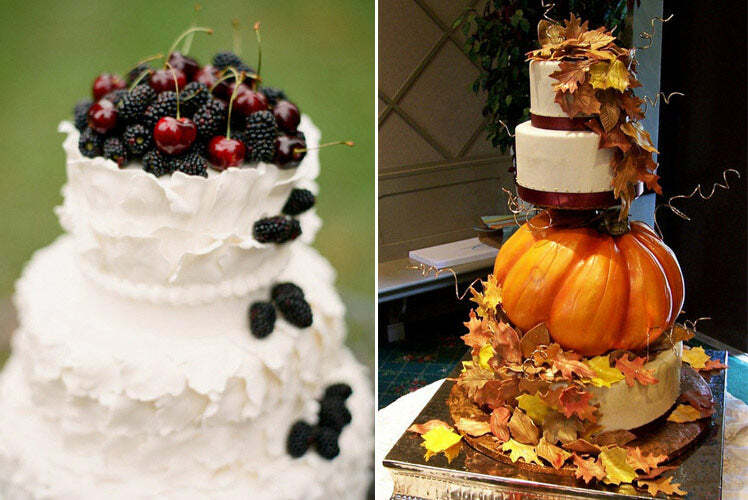 The most popular theme for a wedding has to be the pumpkin. A vibrant colour, incorporate a large pumpkin into your cake stand or decorate your cake with miniature pieces. Another budget friendly décor choice they can also be used as centrepieces for your tables either with candles or as an Autumnal vase for flowers.